The original Robocop movie has a special place in my heart. There was a summer where I watched it almost every day. I seriously wore out the VHS tape and had to get another one. The mix of it being set in Detroit, the crazy violence, and Robocop himself were too much for a young Ken O. to resist. As if that wasn’t enough there was the ED-209. The Enforcement Droid 209 Series was just about one of the coolest things I’d ever seen. I had an old toy one that would fire off caps, but I always wanted a more detailed ED-209 figure. 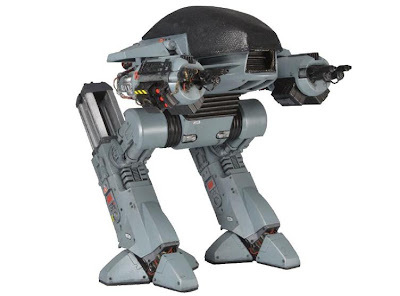 NECA apparently though the same because in September they are releasing a 10 inch ED-209 figure. The figure is scaled to go along with their 7” Robocop. The Robocop figure looks fantastic but I think everyone realizes that ED-209 is stealing the show here. The big guy has an articulated head, legs that slide up and down, hinged arm wing panels, poseable cannon arms, and a rocket launcher that pops out of his right arm. The ED-209 also has sound effects and dialogue. A press of the button gets you those iconic hydraulic sounds and that growl. Whoever decided that a robot should growl is a genius. It also says things like “Warning, throw down your weapon. 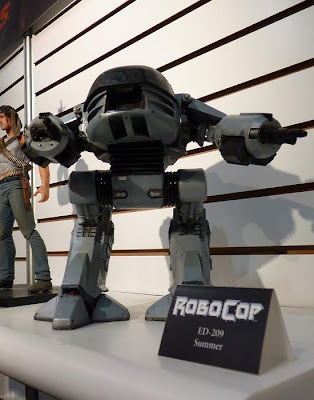 You have 15 seconds to comply.” If you’re drooling over this figure like I am, it’s going to cost you around 70 dollars. It’s an expensive figure, but it looks like it is going to be a quality piece. Just try to keep him off the stairs.